The medical community has identified three types of hearing loss: conductive, sensorineural, and combined. What they all have in common is that one's hearing capacity is, in part, significantly reduced. This has a direct impact on a person's quality of life, health, and social interactions. What you do to manage hearing loss depends on its severity. At the moment, hearing aids are the only means to treat hearing loss effectively. 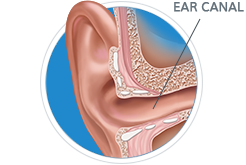 What it is: Conductive hearing loss occurs in the ear canal or the middle ear, and is similar to an ear infection. Obstruction, such as wax, or other damage in the ear can cause conductive hearing loss. What you can do: Doctors normally can treat conductive hearing loss without the use of hearing aids. What it is: Sensorineural hearing loss is the most common type of hearing loss. It occurs in the nerves, and it is permanent. What you can do: While there currently is no way to repair sensorineural hearing loss, hearing aids can help. What it is: Mixed or combined hearing loss is a combination of conductive hearing loss and sensorineural hearing loss. What you can do: Contact a hearing provider to schedule a professional evaluation. The human ear consists of three parts- the outer, middle, and inner ear. consists of the visible part of the ear, also called the auricle, and the ear canal. What we call ‘noises’ are actually just ‘sound waves’, which are transmitted by the air. Sound waves are collected and guided through the ear canal to the eardrum. 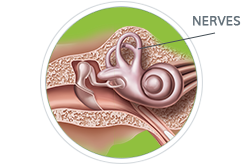 The eardrum is a flexible, circular membrane that vibrates when sound waves strike it. is an air-filled space separated from the outer ear by the eardrum. In the middle ear are three tiny bones: malleus, incus, and stapes, often referred to as the hammer, the anvil, and the stirrup. They are collectively known as the ossicles. These form a bridge from the eardrum to the inner ear. The ossicles also vibrate in response to movements of the eardrum and in doing so, amplify and relay the sound to the inner ear via the oval window. referred to as the cochlea, is similar in shape to a snail shell. It contains several membranous sections filled with fluids. When the ossicles conduct sound to the oval window, the fluid begins to move, thus stimulating the minute hearing nerve cells, called hair cells, inside the cochlea. These hair cells in turn send electrical impulses via the auditory nerve to the brain where it will be interpreted as sound. 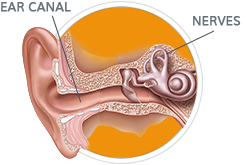 There are different types of hearing loss that are experienced to various degrees and due to several causes. But the symptoms of hearing loss are basically the same. If you answer yes to any of the following questions, there is a chance that you may have some degree of hearing loss. 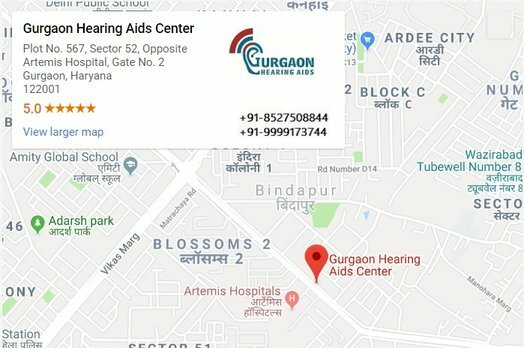 We urge you to have a hearing test conducted by a Hearing Care Professional. Have you missed visits and calls from people because you didn’t hear the doorbell or telephone ringing? Do you have a difficult time understanding the words of popular songs when listening to the radio? An audiogram is a chart a hearing test is marked on. The degree of hearing loss is measured in dB for defined key frequencies. The frequency is measured in Hertz, abbreviated with “Hz”. Curves displayed in Decibels (dB) generally describe the individual hearing threshold of a person compared to the normal hearing average, which lies around 0 dB. Due to individual differences, all thresholds up to 20 dB HL are considered normal. Symbols are placed on the audiogram that show the person’s air conduction and bone conduction thresholds for each of the key frequencies. The audiogram shows the softest level at which a sound is perceived. This is also referred to as the hearing threshold. Different symbols are used to distinguish between air- and bone conduction measurements, as well as which ear the measurement refers to. To read and understand an audiogram, you have to have to a look at the loudness level and frequencies of different speech sounds presented in the audiograms below. Because of the shape of this speech area, it is also referred to as a “speech-banana”. Vowels are low frequency sounds with a higher volume than consonants, which are soft high frequency sounds. The vowels carry the loudness impression of speech whereas the consonants carry the meaning, e.g. house or mouse. 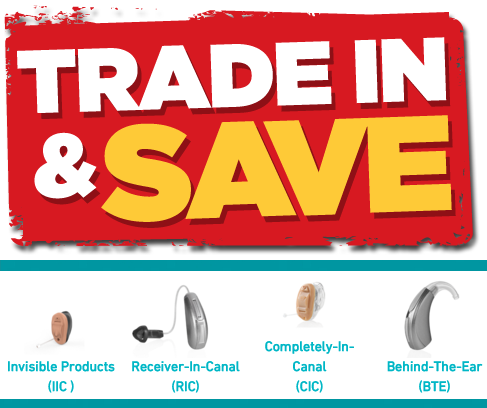 Every year hundreds of old hearing aids are replaced with old ones with our Trade-in Scheme to get better discount on new purchases. 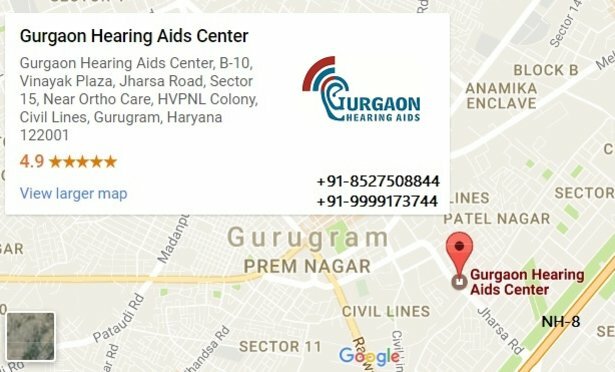 We donate those hearing aids to needy ones at highly subsidized rates, which can open up the world of sound to those people. Many of the hearing aids used at various hearing missions come from the our Hearing Aid Trade-in Scheme. Follow these simple steps to replace your hearing devices and change someone's life today. Bring the hearing aid to us with original box and bill. Purchase any new hearing aid and get flat 30% discount on your new purchase (not more than 50% of your old hearing aid price). Only one old hearing aid can be replaced with one new hearing aid. Hearing damage can already begin at a continuous stress level of 85 dB. If you listen to loud music at a concert or on your MP3-player, for example, you may feel that you cannot hear so well afterwards. 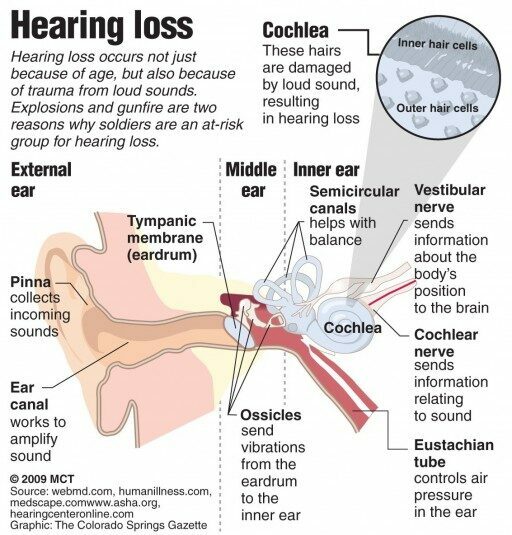 This happens because the fine hair cells of your hearing organ are temporary damaged. After a period of quiet, they recover. This is called a temporary threshold shift, TTS. However, if you repeatedly subject yourself, over longer periods of time to extreme noise stress, these fine hair cells will become severely damaged with no chance of regeneration. This is called a permanent threshold shift, PTS. Listening to loud music at concerts, discos or through headsets can be especially dangerous. The sound intensities through headsets, for instance, can easily reach 110-120 dB. A sudden loud explosive sound like a firecracker can also cause noise induced hearing loss. People in loud work environments are particularly at risk. Construction workers, factory workers, airport-tarmac workers, and musicians should wear hearing protection. Another effect of noise stress can be tinnitus. This is when one or both ears perceive sound for which there is no corresponding external source. In other words, the sounds that are heard actually do not exist. It is often described as a “ringing” in the ears, but it can occur in a variety of forms and sound levels. The only reasonable alternative is prevention, so wear hearing protection! There are many possibilities from commercially available earplugs and earmuffs to individually fitted ear fittings with different filter systems. Different levels of hearing loss are referred to as degrees, depending on the severity of impairment. None 0 - 25 dB No perceptible difficulty. Mild 26 - 40 dB Difficulty hearing soft speech and conversations, especially in noisier or more reverberant situations, but can understand in quiet environments. Moderate 41 - 55 dB Difficulties understanding speech, especially in the presence of background noise. Higher volume levels are needed for hearing TV or radio. Moderate to severe 56 - 70 dB Clarity of speech is considerably affected. Speech has to be louder as usual, difficulties in group conversations will occur. Severe 71 - 90 dB Regular speech is inaudible. Difficulties even with loud speech. Comprehension often only possible through shouting or amplification. Profound 91+ dB Even amplified speech is difficult to understand or even inaudible.